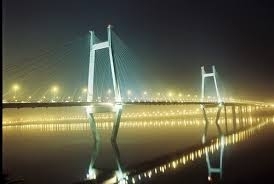 Allahabad the holy city of three Rivers. Allahabad (U.P.) the holy city of three Rivers Name River Ganga River Yamuna and River Sarswati which meet at one place so that also called by the name of ‘Treveni Sangam ’ but now only two rivers can be seen. The oldest name of Allahabad city was Prayag that is still often used by the peoples Allahabad is also called by Tirthraj Prayag means the king of all religious places in the earth. As per Hindu Puran Lord Brahma worship lord Shiva and host ten Ashva Megha Yagya at Prayag the place is now calling by Dashashwamet Ghat also Brahma (The Hindu Deity) Worshiped Lord Beni Madhava the oldest temple is in the Area of Daraganj. Lord Chaitniya Mahaprabhu (Avatara of Lord Krishna )came to Allahabad and stay at the Dashashwamet Ghat, As per hindu religions Saysnaag the biggest Snake more than thousand of heads took rest at prayag after the sea churning. After every 12 years the holy fair of Kumbh celebrated at the inshore of Ganga river millions of saints and peoples came from all over the world in Prayag at that time. Also every year in Magh the same fair celebrated at the same place of Allahabad. The name of Allahabad derived from the one given to the city by the Mughal Emperor Akbar in 1583. The name in Indian language generally is ALLAHABAD illah being Arabic for "God (Allah)" and – ABAD. Allahabad is very spiritual place. That’s why Allahabad has played a very important role in the world history and cultural life of India.